Leave a comment to enter the draw to win the trilogy Twilight of the British Raj in Ebook format. Share on social media, and each time your name will be entered the draw again. Winner picked following Sunday. The Irish are a culture steeped in the oral tradition of handing history down from generation to generation. As a kid growing up I devoured the stories my mother shared with me over the kitchen table of the heroes in our family. One of those heroes was my grandfather’s brother, my great Uncle Eddie who served in the Queen’s Bays, a British Army regiment with a long and illustrious history. The regiment was first formed in 1685 by merging four of the horse troops that were raised to fight for King James the 2nd, but as the years passed, and so did the crown heads of Britain change, this regiment was then called on to fight against the Jacobite rebellions. It was during the second Jacobite rebellion in the 1700’s that the regimental name was changed to Queen’s Bays, having the Queen as their Commander in Chief. They were sent to places all over the world to fight for Britain’s interests such as Germany, France during their revolutionary wars, Waterloo, Ireland during the fight for homerule, to name a few. Jumping ahead a bit, we get to the history that inspires me, when The Queen’s Bays were sent to India during the Indian mutiny in 1857, a period during the British Raj (rule) of that exotic southern continent. Besides my great Uncle Eddie, I have other ancestors who served in India as soldiers, but all of the photos in this article are my great uncle's personal photos. It was just after WW1 that my grandfather’s brother Edward joined this regiment, and he too spent some time in India, and he's somewhere in the photo above. Typical cavalry men, they knew how to play hard. Above is Uncle Eddie in India practicing his trade as a cavalry man with his steed and lance, doing calisthenics with his horse, and steeple jumping. It was in the years between the two world wars that the face of army cavalry changed around the world. Horses were exchanged for tanks, and in 1939, The Queens Bays became part of the newly formed Royal Armored Corps of the British Army. Before sailing on from England on May 14, the Bays were inspected, first by King George VI, and then immediately afterward by their Colonel in Chief, Queen Elizabeth (the current Queen’s mother). This double-event is quite unique in the annals of the British Army. Things were pretty tough for the Queen’s Bays in Europe. Being the first of their regiment to become mechanized, there were too many bugs to work out. Sadly, many of the regiment died or were captured by the enemy. 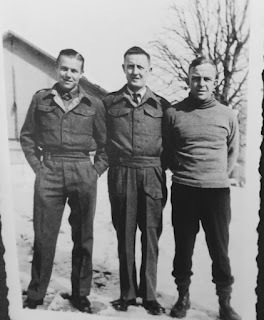 My great uncle was one of those who spent time in a German POW camp in Italy. Family stories say that he did eat grass in order to stay as healthy as possible. But Uncle Eddie was one of those who escaped from that POW camp and made his way to friendly lines. 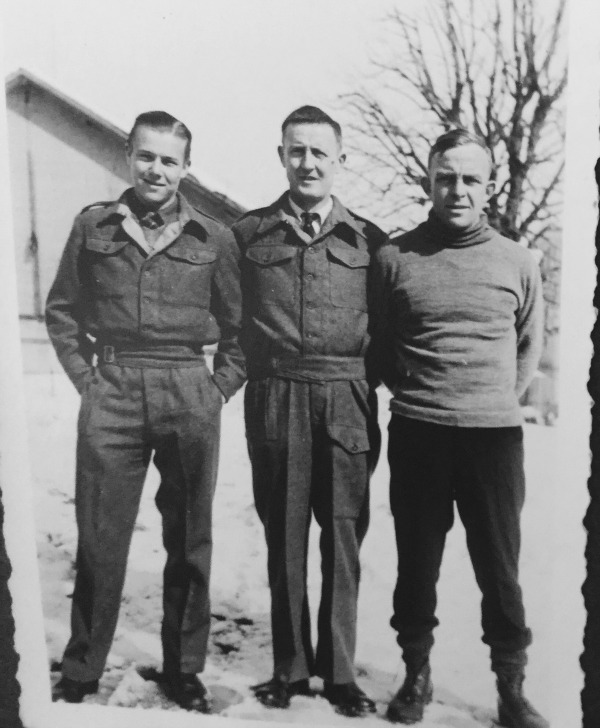 My uncle in the middle, after escaping from the POW camp in Italy. Many years later during the ‘70’s, my great Uncle was invited to London with the remaining men of that regiment to be inspected once more by their Queen, who by that time was known as The Queen Mother. He is the one marked with the yellow arrow below. It was stories such as these of family soldiers who fed my imagination. Eventually my romantic brain couldn’t rest until I’d written not one but a trilogy about soldiers who served in the British Army in British Colonial India. That trilogy is the multi-award-winning Twilight of the British Raj, Book 1 Shadowed in Silk, Book 2 Captured by Moonlight, Book 3 Veiled at Midnight. How fun to have such a rich and interesting history. Not only that, but to also be able to track an ancestor's path in such detail. Thanks Vickie, yes it is one of those stories that gets passed around the family a great deal even to this day. Now the younger generation can read about it here too. I fear that once I'm gone, the history ends there. Thank you for walking us through some of yours! Hi Melody, that's why I think it is so important for our generation to write things down for the next generation. Those old stories are so wonderful, too precious to lose. This is really fascinating! It's wonderful that you have all this info from your ancestors in your possession. My ancestors were just farmers, although my dad flew a plane in the US Army-Air Force in WWII. My nephew asked Dad to tell his story about the war, and we have it now on video. So that is a real keepsake for us. Wow Donna, to have your dad fly a plane during the war is so interesting. What a treasure fo a keepsake, and what a great idea. I never thought of that until you mentioned it, to have that person tell their story and then have someone record it. Fantastic. WOW! Fascinating post! Thank you so much!!!! Such an interesting post, Christine - thank you!! My father was a farmer and didn't serve in any of the wars - however, my brother flew a plane during the Vietnam War and retired from the Air Force. His son served in Afghanistan and is a Chaplain in the Army. Other of my relatives served in WWII. My parents and grandparents, on both sides, lived their adult lives in the small town in which I now reside. A book was published last year by a local resident - on the history of our town. My family provided much of the info and pictures, having lived and owned property here - for generations. We also have a tape recording of an interview of my mother's parents - years ago, some time before they passed away. Thanks for the opportunity to win a copy of your "Twilight of the British Raj" series!! Oh you have such an interesting family history too. I remember as a kid growing up during the Vietnam War being so afraid for the US soldiers, even though I lived in Canada, but we saw it all on the news each night. And what his son saw in Afghanistan. What a beautiful book that was published about your home town. Your family might enjoy Twilight of the British Raj as it has history about Afghanistan and Pakistan when Britain ruled India. So many of the problems from that era are what we are still seeing today. I love books about war---not that I like war---but to see how God brought people through those tough times is so inspiring. I guess that's why I write a lot about soldiers in my own novels. Yes, Lynne, I so agree, those family military histories are so precious. My goodness you must have some great stores (happy and sad) with your family history in the Civil war to Vietnam. Blessings. Most interesting. Thank you. I so value family history that I combined my family's stories and life experiences in my debut historical novel THE CALLING OF ELLA MCFARLAND. If we don't save our families' histories, they are buried along with the elders. Bravo for your work. That is so true Linda. The best stories are those that come from close to our hearts and our hearths. Blessings. I'm proud of my own Irish heritage, too! Thus, I love all things Irish. Wonderful, Donna, and I got your email address. DRUM ROLL, and the winner is Caryl Kane. My husband drew her name out of the hat. Caryl wins my complete trilogy the Twilight of the British Raj in Ebook format. I will contact Caryl via email about her win. Thank you all for playing. See you next month on the 10th. Christine, I am THRILLED to have won! Thank you so much!